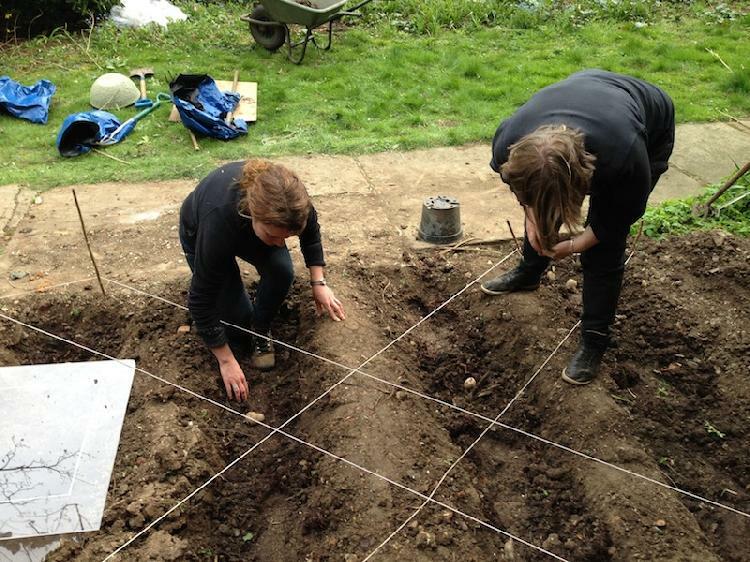 Nadege Meriau and Deirdre O'Mahony planting potato seeds at The Florence Trust, London. 20-21st April 2013. SPUD is a new project organised by Deirdre O’Mahony in collaboration with X-PO and with artists Frances Whitehead, Chicago, Nadege Meriau, London and Grizedale Arts, Cumbria. SPUD provides a metaphorical space for an investigation and reflection on sustainability, food security, changing landscapes and rural/urban relationships. It is a transdisciplinary project involving farmers and artists and will use a mix of documentary film, exhibitions, photography and archival processes to make visible the relevance of rural tacit cultivation knowledge to urban publics today. The process of growing cultivating and harvesting the potatoes in County Clare provides the model for sites in Chicago, London and Cumbria.